Gone are the days where only the most exotic corals broke the triple digit price range. Today we can find medium sized Kenya trees going for over $50, once common softies breaking $30 for small frags and full colonies costing well over $200. The only real way to score a deal on coral frags is when someone you know is breaking down their tank. So why can coral dealers charge such exorbitant prices? Because they make it look so difficult in the stores. Believe it or not their lights are for show and they don’t do any fancy chemistry in the back room. Coral growers simply keep the water parameters in the right range, target feed the corals and give them strong light in the appropriate color spectrum. Setting most of these up takes only the light, power head and a few additives, yet can bring in the LFS thousands of dollars a year. It’s time we cut out the middle man and grow your own corals at home! Again you can grow corals without paying much attention to these factors, but your results will be minimal. Generally softies will need the least amount of light, LPS will need a medium amount of light and SPS will need strong lights. All corals will need a full spectrum of light, specifically 450nm blues. This is the peak of blues where corals can get their energy. Only a little high and it drops off fairly quickly. 460nm is still good but not optimal. Red lights are more used for the Zooxanthella, algae and color pop. Keep these minimal, as high amounts of reds can inhibit coral growth, but still present in your lighting for small benefits. The biggest note here is for maximum growth you will need to use lower Kelvin ratings such as 6700K. While it does not look as good as say 20,000K the lower Kelvin rating allows more of the light to be absorbed by the coral and less is used for blue lights. Still you want your tank to look pretty so consider adding some complementary blue lights. Again this is highly dependent on your corals. Some easy, soft corals love high flow where they have a grass in the wind effect. Other corals like the hammer want medium to low flow as they like to gently bob in the sea. No general rules here except no corals like stagnant water. The position of your coral will affect the water flow it receives as well as the light strength. Lower in the tank, and of course under rocks, will provide much less light and water flow. Depending on the layout of your tank, strength of power heads and lights you will need to move your corals accordingly. Additionally many corals will fight one another using chemical warfare. This is no joke. Read up on your corals and keep the fighters away from each other. Corals are not plants. They are animals. 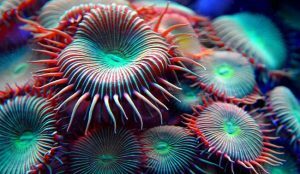 Like all animals corals need to eat to survive and thrive. In most takes they can get by with just the microorganisms in the water. When fed directly, corals will have much more nutrients and will expand to try and catch more food. Eventually this will lead to the coral splitting, expanding or whatever it specifically does to grow. Likewise if the coral cannot get enough food it will shrink and retract its membrane. Spot feeding small foods, such as thawed mysis shrimp or live brine shrimp is a common method of feeding, but some corals are better hunters than others. You may need to adjust your methods. Note: If you have plenty of scavenging shrimp they will steal food straight from corals mouths. Without any predators to hunt these shrimp, corals can be constantly picked clean until they wither away. Try to keep your shrimp at bay while the coral eat, or even banish them to the sump or refugium for awhile. This entry was posted in Corals, General Information on May 7, 2018 by Joshua@themandaringarden.